I also am pointing out an EXCELLENT available location for a new TJ store in Brooklyn ,N.Y. at 4th Avenue & Senator Street [ near 67th Street ] in heavily populated Bay Ridge , on the site of a former American Place Variety store . The location is spacious , 2 minutes from Exit 1 of the Belt Parkway , 2 blocks from the R train and 2 blocks from Bay Ridge Avenue [ which has 3 bus lines running on it ] . The nearest TJ is on the other side of Brooklyn in Boro Hall , and the nearest & only food market nearby is a small to medium sized Key Food locally owned . This location would be one of TJ`s busiest ! Only one TJ for Brooklyn`s 2.5 million population is not enough! bay ridge brooklyn is not park slope or even cobble hill . the neiborhood is very stuck in their ways of eating.also there is very low foot traffic at the location you are talking about,69th and 4th ave. not what trader joes looks for im sure. No I don't think Bay Ridge residents are "stuck in their ways," sorry its not "hip," yet its more diverse than gentrified park slope or cobble hill will ever be; a real Brooklyn neighborhood. A Trader Joe's in Bay Ridge will be great compared to the other terrible supermarkets in the area, like MET/Key Food and other small chains (the Pathmark in Boro Park and Waldbaums on New Utrecht are exceptions to this rule because they are the cheapest stores around). It also gives people an organic option for an affordable price, which I don't think currently exists in Bay Ridge yet. There are a very good mix of people in the neighborhood, many people with money to spend, many entrepreneurs with independent businesses. Trust me Trader Joes, Bay Ridge is money to be had!!!! PLEASE!!!!!!! Come to Florida!!! 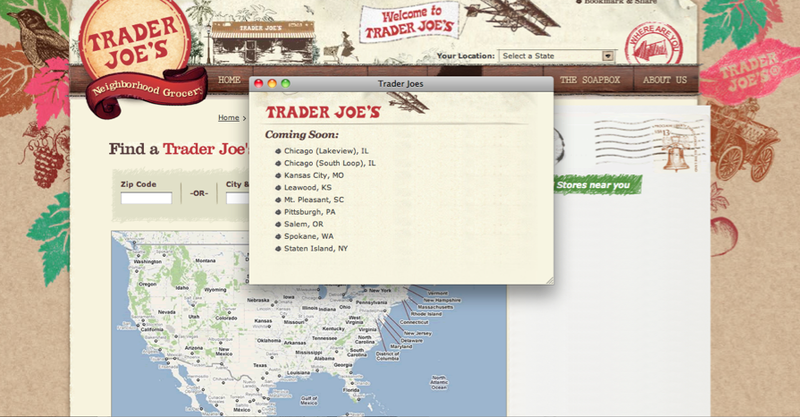 I am a former Californian and miss Trader Joe's SO MUCH!!!! Iam near the Daytona Beach Area and I know so many transplants want one in this area!!!! When do we get TJ in South Dakota? As far as I know, there isn't a single store in the whole state. I spoke with a lot of people who would love to have TJ opened up in Sioux Falls, the biggest city in SD. when is the staten island store due to open? The Jersey Shore sure could use a Trader Joes. Demograhics are very good since the Philadelphia area residents are there all Spring, Summer and Fall. These people are use to shopping Trader Joes and sorely miss it when at the shore. There is no short supply of local residents either who would love it. A Somers Point location offers a mid point between Brigantine and Cape May. People are begging for a break from the large chains. People live in South Dakota? Now they can serve more people because they have these new locations. That'll definitely be great for them. Bloomington IL. Right in the center of the state- home to 2 universities, State Farm and Country headquarters. It would be a huge hit here! PLEASE, PLEASE, PLEASE, Find a spot at the Jersey shore or somewhere not far from there. 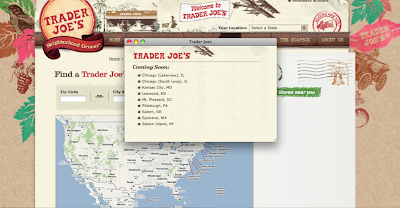 I live at the shore year round and we need Trader joes desperately!!! !